This scripture has always confused me. It’s not because it’s difficult to understand; it’s because I’ve never understood why the writer decided to put it in there. Who gives a crap what they did with Jesus’s clothes? They’re just clothes. Would it have been worth mentioning if they’d decided to toss them out or burn them? And what did a bunch of soldiers want with a soon-to-be dead Jewish guy’s clothing anyway? I think I’m just too American to have seen the point until now. It starts making sense when I understand that clothing was not commoditized then like it is for us. Clothing was handmade and rather precious. The soldiers seemed particularly enamored with Jesus’s underwear, which was hand woven and all one piece. Jesus was broke and homeless, so he clearly didn’t buy those high priced undies himself. I think somebody must have made them for him as a gift, somebody who loved him. This heaps additional poignancy onto an already sad picture — Jesus, stripped naked, nailed to a cross, and a bunch of armored meatheads are tossing dice to see who gets to keep the underwear his mother sewed for him. If I’m ever unfortunate enough to be executed, I doubt anybody will be calling dibs on my stretched out Fruit Of The Looms. It’s strange where the mind goes when we see or hear certain things. I heard an interview with filmmaker Andrew Morgan this week. He’s creator of the film The True Cost, a sobering documentary highlighting the injustices propagated by Western society’s addiction to fast fashion. Fast fashion isn’t enough for us, though. We also love cheap fashion. We love consumable fashion. I get to thinking about all this injustice and the way we’ve turned clothes into consumables, and where does it lead me? Jesus’s underwear. His underwear was the opposite of fast fashion. It was meaningful fashion, worth throwing dice for. No doubt, there’s an extreme mindfulness deficit in today’s world. But maybe there doesn’t need to be. Maybe all the digital pollution that serves to keep us from paying attention can redeem itself by making us aware. I know it did for me this week. I hear about the injustice caused by consumable fashion, and now I find myself checking the labels of my clothes. Of course, it’s not enough to be aware of these things; we must be willing to alter our behavior once we learn of them. Contrary to popular belief, the biblical towns of Sodom and Gomorrah did not meet their doom because of sexual immorality. The New Testament says that God was displeased with the people because they were “overfed and unconcerned.” Sounds a lot like us, if you ask me. I think we can do better. I think we can become more mindful of the world around us and stop being reduced to mindless consumers. I know one change I’m making, starting with my next underwear purchase. No more cheap, droopy underwear for this guy. I’m going to invest in some comfortable, fair trade underpants that a Roman soldier would be willing to gamble for. How about you? In what ways can you be more mindful? Is that a genuine bible quote? I thought you had changed it to make it comedic, either way it is funny. As for mindfullness…I think we can be overly thoughtful too, but that is far less a problem than not thinking. I guess it has to be taught, imbued in the young to be aware of our impact on the grand scale of things. It is indeed a genuine Bible quote. It’s from a modern translation of the passage that says they “cast lots for his clothing.” It’s actually a throwback from an Old Testament passage. The gospel writers would often site these as evidence that Jesus was the prophesied messiah. The part about his underwear is really in there too (in John.) It says the soldiers threw dice to decide who got the garment because they didn’t want to tear it into pieces, since it was so well made. When I heard the interview with the Andrew Morgan, he mentioned that most clothing today is actually made to wear out quickly, so we’ll throw it away and spend money on new. Our entire economy is built on the idea of buy, consume, throw away, buy again. This sort of behavior rots the human soul, not to mention the planet. 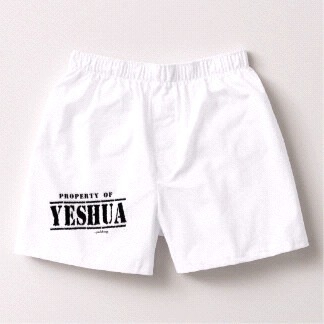 It just got me thinking that Jesus had the right idea with that hand crafted, premium underwear of his. You know people bid on famous people’s possessions. Spending hundreds of thousand dollars for used clothing of Oprah, Beyonce,Michael Jackson, Lennon and such. If I were inclined to spend a small fortune on a pair of Mj’s underpants, I wonder if I’d have the audacity to wear them. Your other point, I recently was in the market for a snowboarding jacket. I can’t just go to any store to find just any jacket, because I’m 6-8 with monkey arms. My wife and I ended up at the Patagonia store, where we expected to pay at least double for a premium gortex coat that fit. And of course it has the Patagonia stamp stitched right onto the front. While i was in the store, there was a certain aroma that one could only smell if their noses were tilted up just enough to get a whif, but not too high to be noticed by others. So i tried a sniff, and I ended up buying a long sleeve waffle shirt with a poly blend. And again, I paid too much for it, but it has the Patagonia patch for everyone to see. To this day, it’s my favorite shirt. I must say the jacket kept me dry, and that shirt kept me toasty warm all season. You know what? I have actually been having this very thought, Lucas! I have, for the first time in my life, invested in two nice pair of leather shoes that do not make my feet hurt. I thought about it for a long time, though. Going back and forth between justifying the “splurging” and convincing myself that I deserve it because I should be important enough to myself that I can purchase a good pair of shoes without feeling guilt. I mean, I’ve always been a bargain shopper but in the end, the money I would have spent on ten pairs of cheap shoes still added up to two pairs of quality ones. So, I’ve made the decision that quality should be more important than quantity from now and now you’ve validated that for me! Hehe! I just love this post so much! You’re the man, Lucas!! Have a wonderful day! I furthered this change in mindset last weekend, when my old junky grill finally kicked the bucket. I decided I was done buying cheap grills that fall apart in three years and end up in a landfill. Money is tight, so I couldn’t afford to buy a really good one new, but I found a used one on Craigslist that cost less than a cheap one would have been new. It’s encouraging that more and more people of our generation and younger are shifting from mindless consumerism to buying with intention.